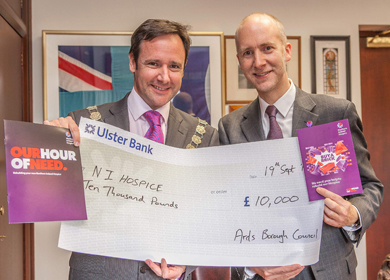 The Mayor of Ards, Councillor Stephen McIlveen, has presented a cheque for £10,000 to the Northern Ireland Hospice, showing Ards Borough Council’s support for the Northern Ireland Hospice Redevelopment Fund. The Council’s financial contribution will help the Hospice to redevelop facilities at Somerton House. Mayor of Ards, Councillor Stephen McIlveen, with Marcus Cooper, Northern Ireland Fundraising Manager, accepting Ards Borough Council’s £10,000 donation towards the redevelopment of facilities at Somerton House. Councillor McIlveen commented: “NI Hospice cares for over 200 people and their families from the Ards Borough area each year and the Council’s contribution to the redevelopment fund will impact positively on our residents, as well as those form across Northern Ireland who use the valuable services and facilities provided by the NI Hospice. I look forward to seeing the plans for Somerton House develop”. Northern Ireland Hospice’s redevelopment plans include a new 18 bed inpatient unit, Day Hospice and an education and research centre on the existing site at Somerton Road. 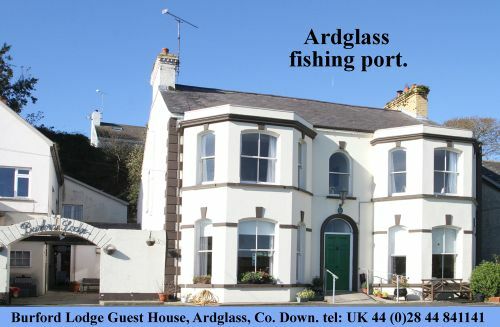 For further information about the plans and to show your support please visit www.nihospice.org or call 028 9078 1836.